What do you guys know about the Golden Mean? the golden mean, or golden ratio, is a concept that appears often in nature. represented by the greek letter "phi". 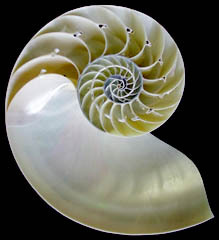 the clearest example of which is in the nautilus shell. the first pic in the thread is a visual representation of the fibonacci sequence: 1,1,2,3,5,8,13,21. . . . . . .
the golden mean, or the golden ratio, is 1 to 1.618. it's a ratio of measurement that you can find all over the place. you can even see it in your own body. from your elbow to the tips of your fingers, compared to from your shoulder to the tips of your fingers = roughly 1/1.618. legs, hands, fingers, measurements of facial features, they all relate in some way to that ratio. info on this stuff is readily available. google is your friend. also check under "sacred geometry". I recently went through some of my favorite paintings and it keeps popping up. Its pretty fun. I wonder if these guys are conscious of using it or if then just happen to do what comes naturally. Or maybe I’m just noticing patterns that aren’t really there. I am stretching the spiral to make it fit the dimensions, so I don’t know what effect that has on the ratio of the fibonacci number. I think its pretty neat to see the combination of math and art in making something beautiful. I think I saw a Discovery channel show that talked about how what we consider a beautiful face is one that has a lot of fibonacci number relationships. yeah, i knew you would start to see it everywhere. if you stretch it, you do affect the ratio, but not if you're just shrinking or enlarging it. a warning though: when you're looking for something like this, you're going to start to see it everywhere. you just have to take it with a grain of salt, and know that even though it's pretty amazing, sometimes it is just a coincidence. i've known a couple of people who went a little too "nuts" over 1/1.618. using that ratio to determine the size of your drawings makes for a great rectangle. using that "fibonacci" curve makes for good dramatic compositions. it's about how the eye/brain interprets things on many levels at once.